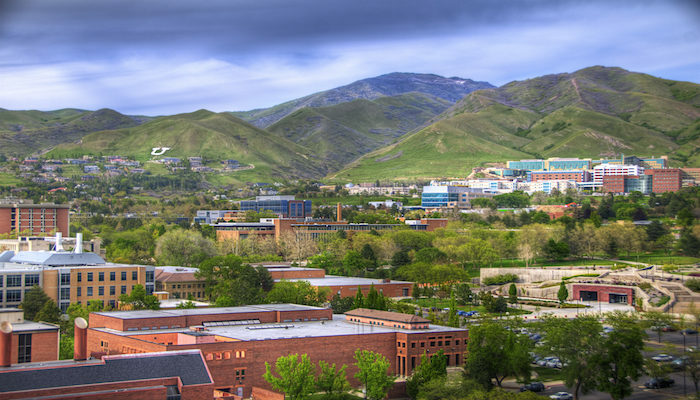 The University of Utah campus, in the northern part of Salt Lake City, is great for running and is also close to some excellent trails into the mountains. The views are fantastic. One can easily put together a 3-4 mile run within the 1,500+ acre campus grounds, or around the perimeter. We don’t proscribe a particular route or path. Best bets for the central campus includes Central Campus Drive, S. Wasatch Dr., and Student Life Way. At the southern end of campus is the huge Rice-Eccles Stadium and some of the more important academic buildings. The athletic complexes and fields are on the eastern side of the campus, off S. Wasatch Dr. There is access to some fabulous trails just east of campus. The Bonneville Shoreline Trail runs virtually through campus. The Red Butte Nature Trail is a great 4-mile loop that is more for hiking but could be run — it is steep in sections and features a ~1,500 foot elevation gain. The Utah Museum of Natural History is worth a visit. Simply wish to say your article is as amazing. The clearness in your post is simply nice and i can assume you’re an expert on this subject. Fine with your permission let me to grab your feed to keep updated with forthcoming post. Thanks a million and please keep up the enjoyable work. Pretty nice post. I just stumbled upon your weblog and wished to say that I’ve really loved browsing your weblog posts.